“Their whole scheme is to create confusion." – Greg Schiano on the Maryland offense. If you were surprised to see Maryland run up and down the field against Ohio State last Saturday, then you likely have a new respect for the Terrapins’ interim head coach, Matt Canada. Though he’d never held such a title before this season, despite his coordinator duties at seven different stops over the past decade, Canada is one of the most respected play-callers in the game today, influencing peers all the way up to Andy Reid and the explosive Kansas City Chiefs. Against the Buckeyes, he showed us all why. Canada’s methods don’t always net these kinds of results, evidenced by his team’s boom-or-bust production this fall. While the Terps have eclipsed the 500-yard mark in total offense four times this season, highlighted by a 712-yard output versus Illinois, they’ve also been held under 200 yards on three occasions, including a measly 100-yard effort just three weeks ago against Michigan State in the week following their blowout win over the Illini. After 11 games, it’s fair to say that the 2018 version of the Ohio State defense falls into the latter category described by Mallory. In their final road contest of the season, the Buckeyes were abused by a freshman running back, giving up 304 rushing yards to Anthony McFarland thanks in large part to Canada’s unexpected wrinkles. Despite bottling up the Spartans’ anemic offense the week prior, Schiano’s unit committed many of the same sins that have haunted them all season long, showing once again why they’ve given up the fifth-most rushes of 40 yards or more this fall among all FBS defenses. The lack of discipline and communication was evident on just the second snap of the game when McFarland would race 81-yards untouched. Expecting the Buckeyes to line up in their base 4-3 Over front with two deep safeties behind them, Canada dictated the matchups he wanted by using motion to force the defense into an awkward rotation just before the snap. By shifting the left tackle over to the right and creating an unbalanced formation with just a guard and tight end to the boundary, Ohio State bumped their entire defense over to match it. Then, by motioning the sole wideout to the boundary across the formation, cornerback Damon Arnette was now responsible for filling the C-gap outside the tight end and setting the edge against a run. But with all the action moving in the opposite direction, Arnette followed the motioning receiver too far inside and was easily out-leveraged on the outside zone run in his direction. The Terps would score just five minutes later with the same play, though this time without motion. Now, with all three receivers aligned to the field before the snap, two Buckeye linebackers shifted outside the tackle box to account for the additional threats there, leaving safety Brendon White to fill the A-gap like an inside linebacker, despite lining up 10 yards from the ball. Though Arnette would play his gap much better this time, setting the edge outside, White was forced to come downhill quickly to plug the open hole between the center and left guard. In his haste, White lost awareness of where his teammates would be, playing the runner with inside leverage and forcing him to the sideline where no one was there to help after McFarland slipped through his grasp. “This is a little different than other games,” Schiano said to the media following the game. “It still came down a lot to tackling. They did a very good job with their scheme. As I said earlier in the week, they put you in a position where you have to make one-on-one tackles, sometimes in space. After giving up two long touchdown runs to open the game, the Buckeyes seemed to have no answers and began cheating on their assignments in hopes of making a stop. Early in the second quarter, McFarland would gash Schiano’s troops yet again as this time White and defensive tackle Dre’Mont Jones both filled the same gap only to see the shifty runner cutback through the open one left unattended right next to it. Though Ohio State would eventually get a handle on Maryland’s unbalanced look, it wasn’t the only trick meant to catch the Buckeyes out-leveraged into the boundary. Canada also unveiled a double-wing set with two receivers on the line and a tight end in a wing alignment to the field, with a running back behind the QB and McFarland as a second wing to the boundary. Before the snap, McFarland would go in a quick, jet motion capable of taking a quick-hitting sweep to the side with extra blockers, forcing the OSU defense to adjust accordingly. But instead of simply handing off to McFarland every time, Canada had an entire series of plays built around this specific alignment and pre-snap motion, all meant to keep the Buckeyes on their heels. While the tight end and left tackle appear as though they’re blocking the jet sweep in the opposite direction, the Buckeye linebackers are caught inside as the rest of Terrapin offensive line easily outnumbers their opponents into the boundary, creating a wide-open seam for the back. To counter such action, the Buckeyes began playing an Under front with defenders covering the B and C gaps and checking to a Cover-3 zone that asked Arnette to bail into deep coverage from his boundary corner position while White came up in run coverage and essentially acted as a fourth linebacker. 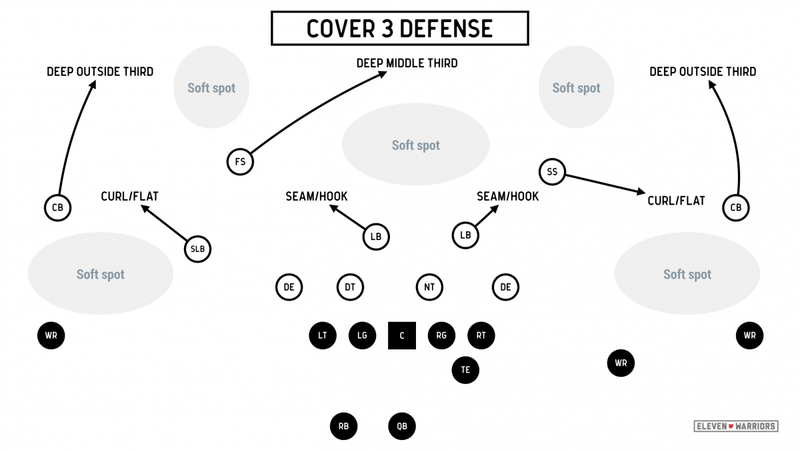 More importantly, Schiano began playing more base fronts without blitzes, stunts, or slants from the front seven in an effort to create penetration. According to the players on the field, this change in philosophy made a noticeable difference. "A lot of times we move a lot, which helps our DBs and what not, but when we go straight we get a lot more penetration," defensive tackle Davon Hamilton told the media following the game. While this subtle adjustment was largely successful against the initial double-wing look, Canada continued to stay one step ahead by experimenting with his formations, sometimes calling for a double-tight end set and creating extra gaps in the running game. As the two teams reached overtime, however, Canada still had one last trick up his sleeve. After initially lining up in the double-wing set to open the extra session, Maryland tight end Avery Edwards shifted toward the sideline giving the offense what appeared to be an overloaded formation into the boundary with two additional blockers. To account for the extra bodies, the Buckeyes shifted over a gap accordingly in their Under front, overloading their alignment towards the boundary. Just before the snap, however, McFarland went in motion again, forcing the Buckeye secondary to rotate their assignments to the field with White coming down to cover the motion man from his deep safety spot. With the front bumped down an extra gap in the opposite direction, linebacker Pete Werner was forced to fill the B-gap to the field while White appears to do the same, resulting in a collision between the two. Meanwhile, end Jonathon Cooper was the only one left to force the sweep back inside, but he was unable to get off his block quick enough to catch up to the runner who was nearing full speed. Schiano’s unit largely kept the Maryland passing game in check, as quarterback Tyrell Pigrome finished 6-13 for 181 yards in addition to taking four sacks, despite giving up a few long balls (including a touchdown pass that was well-defended by Kendall Sheffield but still wound up in the receiver’s hands after an initial deflection). The Terrapins undoubtedly benefited from a number of goofy plays throughout the day, just as the Buckeyes had been the week prior in East Lansing, but the game didn’t need extra time because of a few unlucky bounces. Rather, just as Jeff Brohm’s Purdue offense did last month, Canada masterfully exposed the Buckeye defense for what it is – an undisciplined unit that has relied on physical superiority for the majority of the season - and nearly won the game despite allowing 688 yards to Ohio State's explosive offense. Schiano has been content to set his charges up in a way that should, in theory, allow them to win one-on-one matchups all over the field thanks to an aggressive, man-coverage philosophy. However, smart opponents like Canada have been able to manipulate the chess board in their favor, creating matchups that put the defense in a consistent disadvantage despite having far more talent on the depth chart. This doesn’t mean that the Buckeye DC is wrong for wanting to play aggressive man-coverage, but rather that he’s been unable to teach it in a way that prevents breakdowns when the offense has a plan to attack its weakest points. Nor is he seemingly capable of making adjustments on the fly, opting to wait until halftime in a manner similar to his colleagues on the offensive staff. Dre’Mont Jones is correct in saying that this year’s unit lacks the same talent as previous seasons, but not because of Denzel Ward’s 40 time or Raekwon McMillan’s superiority in the three-cone drill. Instead, those recent high draft picks were far more disciplined after being tutored by different teachers, as only Larry Johnson remains on the staff from the 2014 national title team. While it remains to be seen whether this week’s opponent is creative enough to put the Buckeye defense in the same precarious positions as we saw from the Boilermakers and Terrapins, it’s unlikely we’ll see the Silver Bullets suddenly clamp down in run support like seasons past, despite what their defensive coordinator may say publicly. "We'll have to play better than we did on defense or we won't win the game," said Schiano's boss when asked whether his team is capable of playing this way when Michigan comes to town Saturday afternoon. "That's going to be the message all week and I anticipate we'll play much better."